So I still see Bismarck crates for sale in the Prem shop. What would I get in them if I bought one? No way I'm dropping 90 samolies on one. But I could handle $15. I already have the Bismarck and a 10 point Captain. 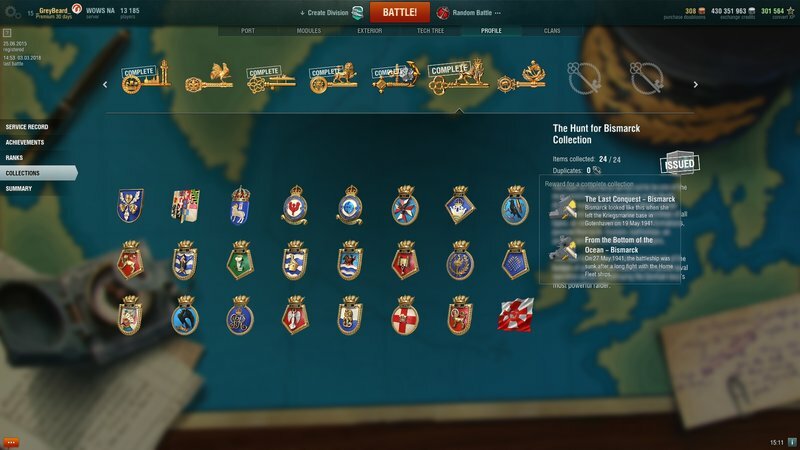 you get hunt for the Bismark campaign collectibles. the ones for the permanent cammo for Bismark and Hood. if you completed it the first time the collection came around, then there is 0 reason to purchase these containers. Never participated in that collection thing. How many are required or is there a chance I will get camo in one of the crates? Location: Where the wind comes sweeping down the plains. Yes though, you would be paying to do so, when many players ground it out for free. If money is burning holes in your pocket, then by all means go for it. However, as has been said in similar threads, the availability may just be for players who couldn’t get the last few collection pieces when it was out before. Well I tried a $15 Bismarck crate. Got some camo and flags and some useless crap. No sense in even messing with Bismarck stuff unless you actually did it before and were missing a little bit. On a brighter note...I got all the crates I needed to get that Frenchie 10 point Captain buy buying two $13 crates. After you complete the collection, the new duplicates that you receive give you 10K credits. Usually, special flags (7-12 or so); Camos (5); artifact (sometimes 2). Thanks for all the replies. Really appreciate it. Think I will pass on the Bismarck thing. What I got was worth what I spent. But it would cost a fortune, as others have said, to get the whole thing just for the camo. Can I assume the Yamamoto crates are the same type of deal? I still get a chance to win Bismarck crates from time to time. I have 12 out of 24 with 7 dups. It takes 4 dups to buy a missing item. They may continue offering Bismarck crates in game for a while?